I'm always on the hunt for a new holy grail product. 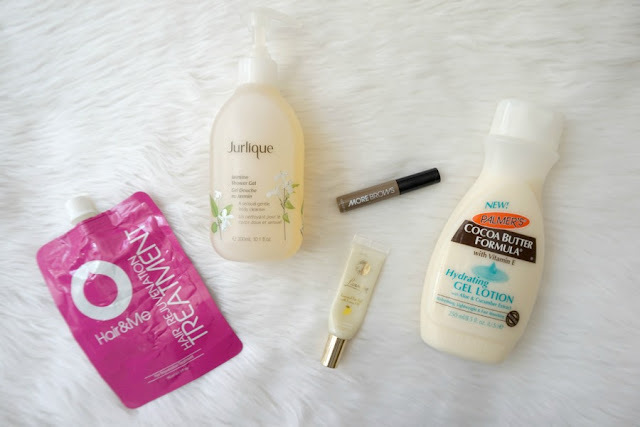 In the quest to find the next best thing, I try out a lot of new and different products each month. 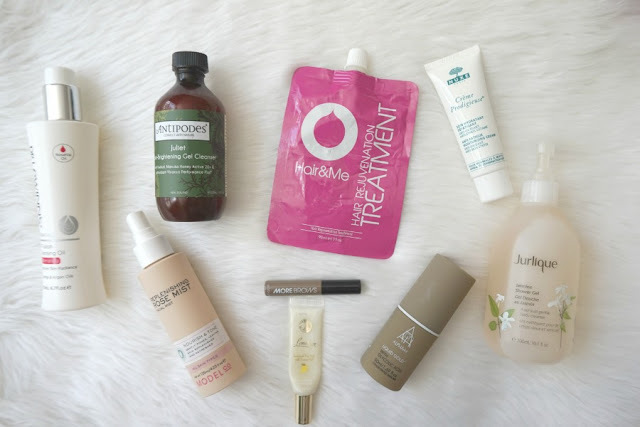 But there are some products that have impressed me so much that I've purchased and repurchased many times over. When it comes to affordable oil cleansers, there's not a huge amount available from Priceline/drugstores. One that's available that I adore is the Dr LeWinn's 4 Fusion Cleansing Oil. This is my 4th bottle. I like to stock up when Priceline has their 40% off skincare sale. It smells lovely, removes my make up easily and lasts for months. Another product that I stock up on when Priceline has their sale is the Antipodes Juliet Skin Brightening Gel Cleanser. While I try out a lot of cleansers, this is the one I always go back to. It cleanses my skin without making it feel dry and I rarely break out when I use this. I always use a toner and my favourite one is the ModelCo Replenishing Rose Mist Facial Mist. It smells incredible and the mist feels so incredibly refreshing. Another toner that I've bought multiple times is the Avene Thermal Spring Water (not pictured). While most people think that it's (expensive) water in a can, I find that it really helps to deal with any redness in my skin. It's also perfect for sunburn. Alpha H Liquid Gold is a cult product for a reason.... it gives great results. I have a more even skintone when I use this and my skin feels softer. I'm currently on my 5th bottle. When it comes to serums, I don't often repurchase a product, but the L'Oreal Skin Perfection Concentrated Correcting Serum is one that I've purchased 3 times since it launched. It's a creamy serum that sits perfectly underneath my sunscreen and makeup. Because L'Oreal is stocked at so many different stores, each bottle that I've bought was purchased on sale. I'm a huge fan of the Nuxe Anti-Fatigue Moisturizing Cream for Normal To Combination Skin. It's a wonderful moisturiser that both hydrates my skin that also makes a fantastic base underneath my make up as it sets matte. My holy grail lip balm is the Mecca Cosmetica Lip De Luscious Treatment (not pictured). It has a slightly oily feel and it really hydrates my lips. It's pricey but worth the money. These are my holy grail, can't live without skincare items. 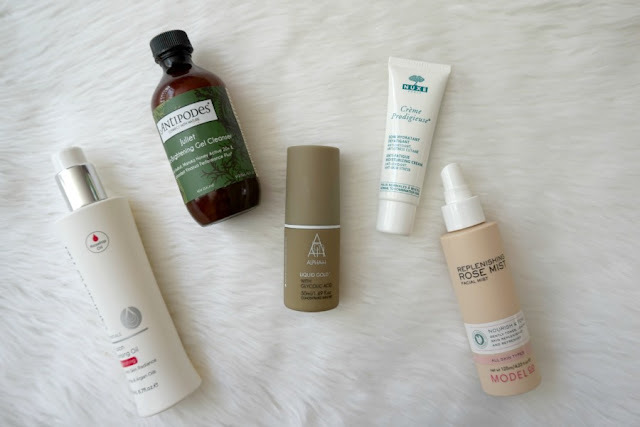 I'm sure you've noticed me blogged about them if you're a regular reader and you've seen quite a few of them here in my last Priceline skincare haul. I struggle to finish most makeup items but regularly go through foundation. I adore the Bourjois Healthy Mix Foundation (not pictured) and love to use it especially in the summer time. I have purchased 3 of the ModelCo More Brows Eyebrows Thickening Gel as it's a much more affordable version of the Benefit Gimme Brow. It's an awesome product to use when you're looking for a more natural brow look or when you're in a hurry. If I see it on sale at Woolworths in the city then I always pick one up. I adore the Lanolips Lemonaid Lip Aid as it helps to both exfoliate my lips and hydrate them. I've purchased 5 of them as once you've tried it you can't live without it. I first tried the Jurlique Jasmine Shower Gel when I was on my honeymoon in Tokyo and every time that I use this, I'm taken back to that time. It's on the pricier side, but it's worth it for the sentimental aspect. I've been using Palmer's moisturiser since I was a teenager and always go back to them. They're such a great moisturiser as they're affordable and really hydrate my skin. I love the Palmer's Hydrating Gel Moisturiser and have 2 bottles in my back up cupboard. Another affordable body product is the Nivea In Shower Body Lotion (not pictured). I practically drowned in it when I was pregnant as it helped with my itchy skin. I love how they've brought out different scents and different levels of hydration. The Hair&Me Hair Rejuvenation Treatment is a wonderful organic hair treatment. There's only 4 ingredients but those 4 oils hydrate my hair amazingly. I have used three of these wonderful pouches of goodness (one of those was sent to me as a press release) and will be purchasing more. They're about to releasea Peppermint shampoo and conditioner and I'll be purchasing a mask when I order the shampoo and conditioner. What products do you purchase again and again? I want to buy everything you have mentioned. Your recommendations really work for me. The Nivea In Shower Body Lotion is a staple of mine so I've repurchased it many times! I'm using the rose mist at the moment and really liking it (I normally repurchase the Sukin one). I have repurchased the Simple wipes, Sanctuary Spa cleansing oil, and Venus 5 blade razors lol.